10ft x 8ft Construo Popup Truss Display "Graphic & Hardware"
10 x 10 Trade Show Truss Displays and Exhibits Benefits Enhancing Your Exhibitions When it comes to promoting a product or service of some sort, whether it is an old product which has been revamped and improved, whether it is the launch of a new product, or whether it is something new that they are introducing a new addition to a product or service line, the best method and the oldest method that companies use to promote it is through trade shows or Trade Show Exhibits. Those are just some examples of what you can expect at trade shows and there are plenty of other types of trade shows out there - automotive trade shows, educational trade shows, informative trade shows and so much more. Trade shows can be summed up as events or activities that operators and promoters use to promote their products or service by holding Trade Show Exhibits. And what these exhibitors and promoters use at their booths are known as a trade show booth truss, or they can be called 10 x 10 Trade Show Truss Displays and Exhibits, or you could even call them plain old tradeshow truss or convention truss. No matter what you want to call them, one thing is for sure and that is these trusses are a popular essential among any exhibitor who wishes to hold a trade show. So why are these trade show booth truss, or trade show truss systems so popular with the exhibitors? Here are some of the most common reasons why: - 10 x 10 Trade Show Truss Displays and Exhibits like the tradeshow truss or convention truss are quick and easy to assemble. The thing about exhibitions is that you are going to need to move around from location to location as quickly and as fast as possible and you cannot possibly have anything that is too heavy to lug around everywhere with you because it is going to be a real hassle transferring them from location to location, which is why the truss is the best possible solution and the most popular option in this case. Being quick and easy to assemble is a major plus point because not only do exhibitors have to be able to move fast from one location to the next, they have to set up fast too if they want to keep up with their competitors. 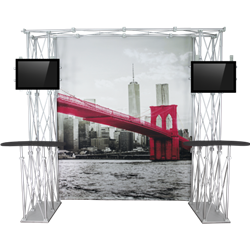 - 10 x 10 Trade Show Truss Displays and Exhibits like the ones used at Trade Show Exhibits are also lightweight, or most of them are at least, which is also a benefit because that means they are easy to work with. Exhibitions are something that you have to be ready to be on the move when required and a lightweight truss is exactly what you need to work with because they are lightweight which makes them easy to ferry around. It is right along there with being quick and easy to assemble and the lightweight truss is perfect for any kind of exhibition that requires multiple locations. - 10 x 10 Trade Show Truss Displays and Exhibits such as the trade show booth truss can support a lot of weight, which is something you need when it comes to exhibitions. The weight of whatever it is you are displaying or promoting to the gathering crowd would depend on the kind of exhibition you are holding, but one thing you need to make certain is that the truss system you use would be able to support a substantial amount of weight in most cases. You could even place something like a plasma screen on it and it would still be able to support the weight of something like that. - 10 x 10 Trade Show Truss Displays and Exhibits also come in varying designs so you can find one that meets your exhibition requirements. If you are having a large exhibition with many displays, then you pick trusses which are much larger to meet your requirements, if you are having a medium sized trade show, then you can select a medium sized truss system that would be perfect for your exhibition and the same thing applies if you are having a small exhibition. In addition, they come in varying designs and styles as well so you can pick out a design that you like that you feel would suit your exhibition and complement it. No matter what your exhibition needs may be, you can be sure that you can find a Trade Show Truss Systems Exhibits and Displays that will work well for your exhibition, so select the one that is the most appropriate depending on the type of exhibition you are going to hold. We offer thirteen different 10' x 10' Truss System Booth models ranging in price. You can choose from a range of packages that include graphics and shelving options. These displays are fully versatile and can easily be expanded to 10 x 20 and 20 x 20 models with additional parts. You can also purchase additional shelving, TV mounts, and literature racks.